This week, Animal Voices speaks with Richard Twine, researcher and lecturer at England’s Lancaster University’s Department of Sociology and Centre for Economic and Social Aspects of Genomics (Cesagen). In 1996 he started the website www.ecofem.org– now a long standing online presence for the dissemination of ecofeminism. In 2001 he finished his PhD on ecofeminist theory and since 2004 his research has included a significant focus on the social and ethical dimensions of animal biotechnology. He credits this engagement with finally turning him vegan the same year. He also teaches gender studies at Lancaster University and is an active member of the Institute for Critical Animal Studies. 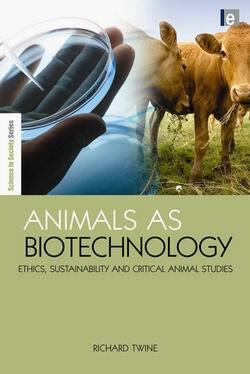 We speak with Twine about his new book, Animals as Biotechnology: Ethics, Sustainability and Critical Animal Studies, his research, ecofeminist theory, science studies, genomics, environmentalism and animal biotechnology. Tags: Climate Change, Farmed Animals, Richard Twine. Bookmark the permalink.